Stewart Architecture, Stewart Hollenstein and ASPECT Studios have been named winners of the Downtown Q 2025 international design ideas competition for Queanbeyan, New South Wales (NSW). Run by the Queanbeyan Business Chamber and endorsed by the Australian Institute of Architects and the Australian Institute of Landscape Architects, the single-stage design competition invited Australian and international designers to reimagine critical sites within the central business district of Queanbeyan. 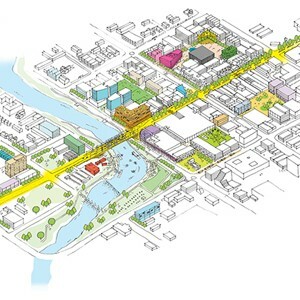 The joint collaboration’s winning scheme, Rivertown: Queanbeyan 2025, proposes to create a more walkable and connected city, with the Queanbeyan River – the town’s greatest asset – repositioned at the heart of an expanded town centre. In the design, the river plays a central role in providing opportunities for the area to develop its own unique character. A Riverfront Park Precinct occupies the centre of the town and will become a focal point for the recreational, cultural and social activities of the community. Expanded park facilities on the river banks offer places for events, leisure, play and respite within an improved river ecology. New city spaces have also been introduced throughout the redefined urban core, including civic, local village and heritage squares and a revitalised river parkland. These are connected by a network of new pedestrian ways, with the main civic square becoming Queanbeyan’s new cultural hub. The main street of the regional centre, Monaro Street, is significantly re-energised and transformed with greenery and more space. Pedestrian and cycle connections will provide a city loop and connections to surrounding neighbourhoods. At the same time, the existing Queens Bridge will be reinvented as a generous pedestrian and event place that works to reconnect the city with the river. According to the judges, this reinvention of the bridge establishes a ‘new town’ in counterpoint with ‘old town’ – a strategy that has potential for a different density and typology which has already proven successful in many global cities. “This design presented a ‘big idea’ with the strategic potential to retain and enhance the best of Queanbeyan,” says Australian architect John Wardle, who was chair of the competition jury. “New elevated pedestrian and event public walkways either side of the bridge place the river at the heart of the Downtown community experience and create a unique and celebratory activity gateway that welcomes as it binds the town together. Subtle level changes along these walkways embrace the waterfront, create a myriad of spatial opportunities and generate positive relationships with the Riverside Plaza and foreshore parks. The competition, which launched in August, received 30 entries from around the world. The winning entry by Colin Stewart Architecture with Stewart Hollenstein and Aspect Studios received $30,000, while the judges also chose to award a discretionary $2,000 prize money to the commended proposal, Clearwater, by McGregor Coxall. To view the full jury competition report, please click HERE or visit http://downtownqcompetition.com.au/entries-2/ to view all the competition entries.